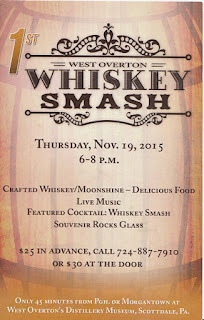 Fayette/Westmoreland Forgotten History: West Overton Plans Whiskey Smash! 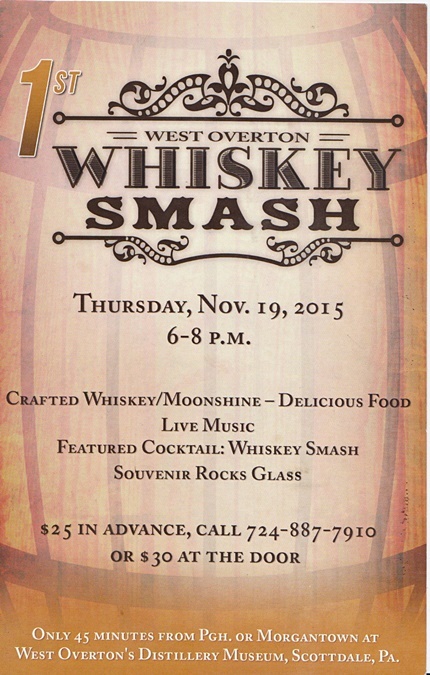 West Overton Plans Whiskey Smash! I expect you all had a good Veteran's Day! This is just a Quick Update for an extravaganza slated for Thursday, November 19, a week before Thanksgiving. Imagine the distilling of liquor in our neck of the woods, what a thought! Without going into explanations too deeply, the nature of this website calls for more meaningful posts, with a limited amount each month. I found myself working on a few other posts in a sporadic fashion as time would permit. Recently my blog moments were spent mostly between various stages of different plans, and thus I got caught in the crossfire figuring out which would be in what order while none was yet completed. On the bright side, this will allow a few needed weeks to perfect things and the next will be available close to the end of the month. First up, unfortunately I didn't make it to the Annual Membership Meeting and could kick myself for not being flexible enough to fit this into my schedule as I really wanted to be there in person. The point is, there is likely a better perspective to what will go on there if one would of heard things from the inside. Not to long ago, I reported on West Overton history with a tour that included a brief interview for a blog post. Now there is an intimation at the upcoming Whiskey Smash mania of a big announcement. 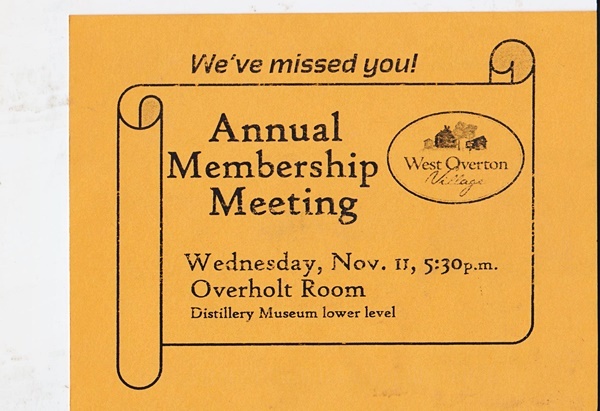 Besides the proposed whiskey tasting from other regional distillers and lots of good food, my guess is this concerns the thrilling details of distilling and whiskey production at, or near, West Overton in the near future. It's not that they did much to keep the idea a secret! I haven't yet been able to wrangle a proper commitment to this engagement for a certainty, as it would be easier for a weekend to be more sure, BUT, don't let that influence you one iota. This event does appear to be an exciting one! If I can get to it, I would love to have the opportunity to meet up with you there. Here's hoping those that do take the opportunity for this special experience, thoroughly enjoy themselves!